Left or right handed: A marksman needs both hands! 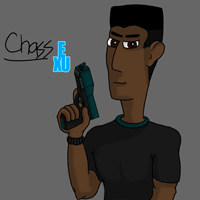 Chass is very well known for his ability to hit things at extreme speed and distance. With his two trusty autoR6-32 9mm, which uses caseless shells, he's a force to be reckoned with in any situation. This is probably also the main reason Boss hired him. He usually hangs back and keeps an eye out for potential threats when on a job. Chass is very serious about almost everything. Which in some cases end up in some pretty hectic or funny situations.